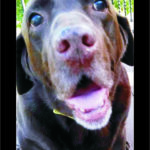 We wanted to send a short note of thanks to Central Indiana Lab Rescue for the company of Shane over the last 8 years. We recall it was a long, cold December drive to Indianapolis to pick Shane up, but it was a shorter, warmer trip home. That was what Shane did. He made the long, cold journeys shorter and warmer. We were advised by CILRA that Shane was very poorly treated before we got him. How he could offer such a warm, loving pose to anyone he met given how he was treated was a daily tribute to the power of forgiveness. In the end he was blind, deaf, mute and had 3 legs riddled with arthritis. 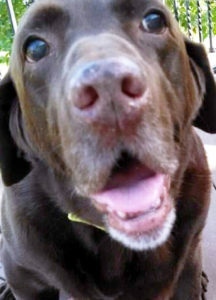 Even though he could not see out of those big , brown eyes, you could always see in to that gentle, loving spirit. When coming home after a hard day he was always waiting to show you that what really matters is, well, all that really matters. My father once told me that if you can honestly say that you had a handful of truly loyal, trusted, go-to friends in your lifetime you can consider yourself a lucky man. I don’t know if he meant to include dogs, but we feel as if we lost one of those today. Goodbye Shane! — Dave, Cheryl and Brian T.
P.S. This picture was taken after the third bath after his confrontation with Mr. Skunk. A great memory….not so great at the time though! Volunteer today to help our Labs find forever homes!